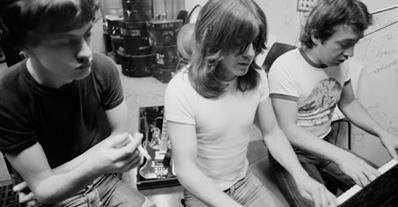 UPDATE: DEC 12, 2017: This page will be updated soon with a piece on the deaths of George and Malcolm Young, and what they both meant to Australia rock, but for now, it's time to hear George, Angus and Malcolm Young back in 1973, recording as the Marcus Hook Band. This was the first big project for George Young and Harry Vanda after The Easybeats, and the first studio recordings for teenagers Angus and Malcolm. Working from a heavily scratched vinyl, I've remixed some of the songs to highlight the guitar playing of the brothers Young. All the Marcus Hook Band songs are worth hearing in full. As well as being a test-run for Vanda and Young's Flash And The Pan, the month of late night 1973 studio recordings also revealed how incredible Malcolm and Angus sounded playing together, just how talented they were. And they could get it down in the studio, and do it fast..
AC/DC were born in these sessions - the swinging hard blues is already there, the boozy, chant-friendly pop, some of that AC/DC pummelling attitude, and the tone of the guitars. Oh, Boom. There's that sound. I'll do a separate post for the rest of the remixes, but here's two for now, to remember the time in 1973, when George Young invited his younger brothers into a recording studio and created the sound of Australian pub rock, or at least, the Australian pub rock sound that would soon take on the world. If you think that sounds like Malcolm Young on slide guitar, it probably is. The Angus Young solos are already signature. He was 17. More To Come. The story of AC/DC is not yet done. AC/DC Latest News, April 19: Brian Johnson Confirms AC/DC Future Still In Doubt - "I Don't Know What Happens Next"
UPDATE: April 13, 2015 - Very happy to acknowledge, one year later, I was wrong in the below story in stating AC/DC would come to an end without Malcolm Young. AC/DC have now debuted their new first new live show in five years to mostly positive responses at Coachella, have sold more than 2 million tickets to concerts across Europe and the US and tickets are about to go on sale for stadium and arena shows Australia later this year. - By the time AC/DC's 2015 tour winds down, they will have sold more than 4 million tickets, making it the Biggest Tour Of 2015. - AC/DC have lots on open dates on their Australian tour (between the announced capital city shows), which means if tickets sell well, they could keep announcing more shows. Predicting this will happen, and AC/DC will play to more than 500,000 Australians by Christmas. - AC/DC's new 'Rock Or Bust' album will be either the biggest selling album of 2015, or within the Top 3 best-selling. AC/DC are ending their 41 year career on a terribly sad note. Plans were underway for a new studio album, their first since 2008's monumental Black Ice, and a '40th Anniversary' world tour, 40 huge shows across the globe. More than a month ago, founding member, rhythm guitarist, co-producer and co-songwriter Malcolm Young had a stroke, which left a blood clot on his brain. 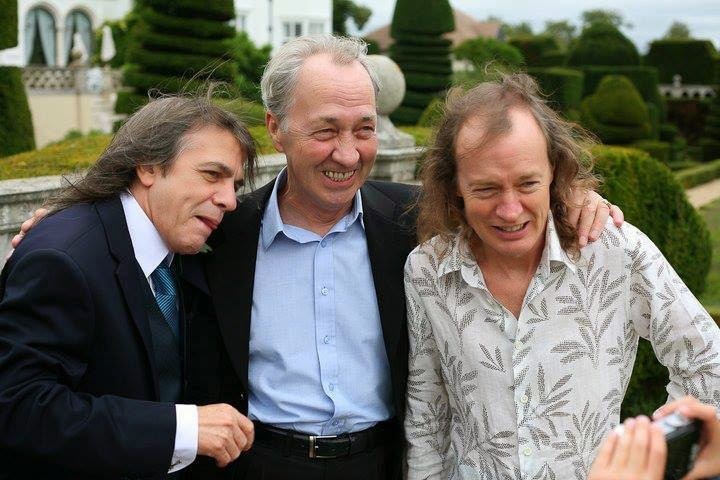 When AC/DC reunited at the start of April to begin a month of rehearsals, in the lead-up to new album recording sessions, Malcolm discovered he couldn't play. At least, he couldn't play like he used to play. Nothing has been officially confirmed, as of this writing, but friends and family members have been discussing what happened to Malcolm for the past couple of weeks. The blood clot, resulting from the stroke, is believed to be why Malcolm couldn't keep working. Although friends have described Malcolm's condition as serious, it doesn't mean he won't recover. People do get better after strokes, and people do recover lost skills. But friends and family of band members believe the decision was made last week to call it quits. Media in Australia have gone ballistic today on rumours of The End Of AC/DC, and it appears the news got out ahead of a planned official announcement from the band and management. Right now, that announcement is expected Wednesday, April 16, and a press conference has been scheduled. AC/DC won't continue playing and recording without Malcolm. It can't be done. 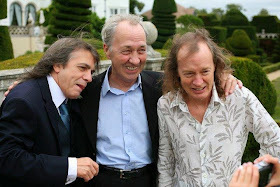 While Angus Young is the more famous, and more recognisable, AC/DC is most definitely Malcolm Young's band, he started AC/DC, under the guidance of big brother George Young (ex-Easybeats, and co-producer) and encouraged his younger brother Angus to join him, and take on the world. Malcolm Young has been the quiet motivator and boss of the band for four decades, co-writing nearly all of AC/DC's classics, and making sure nothing happened to harm or damage the band's reputation, or disappoint the fans who've stuck by them for decades. His passion for the band and its music, and integrity, were so intense, back in the 1970s he used to have fistfights with his younger brother, Angus, in the studio, when disagreements about a sound or riff couldn't be resolved. Proper punch-ups, teeth were lost, blood was drawn. So that's it. AC/DC are coming to an end. But what a career. AC/DC set out to conquer the world, and they did it, multiple times. Even the death of singer Bon Scott barely slowed them down, and only slightly delayed recording sessions for Back In Black. Back In Black is still one of the biggest-selling albums in rock history, and AC/DC have easily sold more than 180 million albums, and probably half as many singles and DVDs and videos and special edition packages. They've influenced pretty much every hard rock, heavy rock and heavy metal band that has followed in their wake, including Nirvana, Metallica, you name them, they probably grew up loving AC/DC. And AC/DC are still in the record books for one of the biggest live audiences in rock history, playing to more than 1.6 million people in Moscow, in 1991. They were invited to play by the youth of Russia, who grew up on AC/DC bootlegs, after the fall of the Berlin Wall. The band have been written off by critics, numerous times, but they stuck to their guns and beliefs and never compromised their sound. They were rarely, almost never, tempted by the musical fads that came and went over the decades. They dabbled in glam rock at the start of their career, but that barely lasted through the recording sessions of their debut album. Their fans wanted rock n roll, heavy rock, they could rely on, and that's what AC/DC delivered, across more than 14 albums, and numerous live-in-concert releases. Malcolm Young never gave up on his belief that 1950s and 1960s rock n roll was rarely bettered, and he used the riffs and rhythms of black blues players as the basis for AC/DC's sound. He's also cited The Rolling Stones' Keith Richards as a key influence, and talks about that influence in the below interview. The secret to Malcolm's playing, as Guitar Magazine explained, was open chords with the amps turned down, not up, and mics shoved right up close to capture all the details. He didn't churn out huge rock riffs through blasting amplifiers, his playing, and magic, is much more subtle than that, despite the rawness of the early studio albums. I still reckon AC/DC's 2008 album Black Ice was amongst the best they made, right up their with Back In Back and Highway To Hell (their last album with Bon Scott), it's absolutely killer, and filled with excellent playing, classic AC/DC songs about rock n roll and some of Brian Johnson's better vocal performances. It's also pretty much a live-in-the-studio album, with minimal overdubs, just like they did it back in the Alberts Studio days in the mid-1970s. Malcolm's work on Black Ice, in particular, is superb, not just the detail of his playing, but also his songwriting with brother Angus. They worked on the writing of the Black Ice songs for five years, and gave themselves the time to get it right. They nailed every single one, and Black Ice became the 2nd highest selling album of 2008. Rock N Roll Dream, from Black Ice, is everything AC/DC was about. They wanted the rock n' roll dream, they got it, then they lived it. "And it could be the very last time..."
Malcolm Young and his family have now returned to Australia. Everyone is hoping he makes a recovery, but close friends are saying the situation is not looking good, right now. Things may change. We can hope they change, and Malcolm recovers. Instead of linking to an AC/DC classic, most of which you've probably heard a thousand times already, here's a rare treat instead - Malcolm Young's rhythm guitar from Let There Be Rock, way back in 1976. "That is true, Malcolm is sick. "From what I understand, and it's even been confirmed in part by his son Ross (Young), that it would appear Malcolm is unable to perform anymore. "It's not just that he is unwell, it's that it is quite serious. It will constitute that he definitely won't be able to perform live. "He will probably not be able to record." An official comment/announcement from AC/DC management is still expected today. It is understood Young returned to Sydney with his family before Christmas and was having in-home care at his house in East Balmain. He is now said to be having difficulty remembering familiar faces and having increasing problems communicating. "His memory loss is so bad it is consistent with Alzheimers or dementia although we do not know that is what it is. There has been talk about cancer too." The response online, and on radio, to news of Malcolm's illness has been massive. If AC/DC were in any doubt that millions of people around the world still love and respect their music, and their skills and talent at songwriting, they should wonder no more. AC/DC are still the biggest rock band in the world, with devoted fans across three generations and from just about about country. Nobody can really believe it. That might be the last we hear from anyone in AC/DC for now about a new album, or tour, or Malcolm Young's illness, for now. Sounds like there won't be a media conference, and the studio sessions will be to see if anyone comes up with new songs and if they're worth recording. We can only hope. 2008: AC/DC - The Musical?